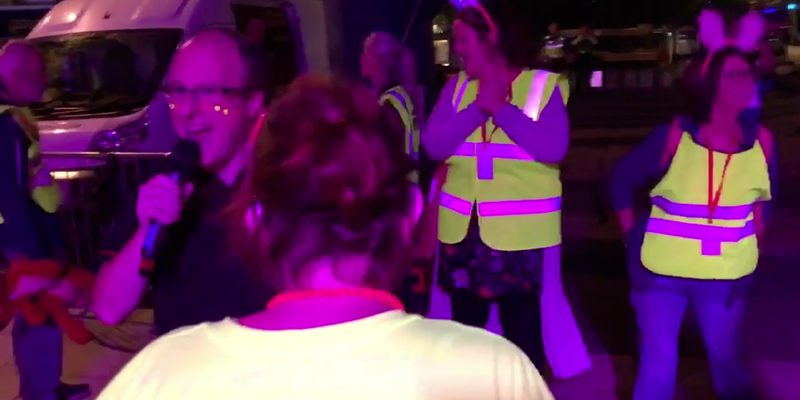 Heather volunteers at St Luke’s charity shop every Monday, she is an avid fundraiser and wanted to show her support for the work that St Luke’s do and so she decided to take part in the Midnight Walk. The walk took place on Saturday 21st July 2018 and the theme was neon. There were lots of glow sticks and sparkles. Everyone started at the Piazza on Royal Parade, Plymouth and Heather walked 3 miles and raised £100.00 for St Luke’s Hospice, a charity that supports people with end of life care. Heather dancing not walking and having fun. Well Done to our very own Heather and everyone else that took part, its great to give something back to others.